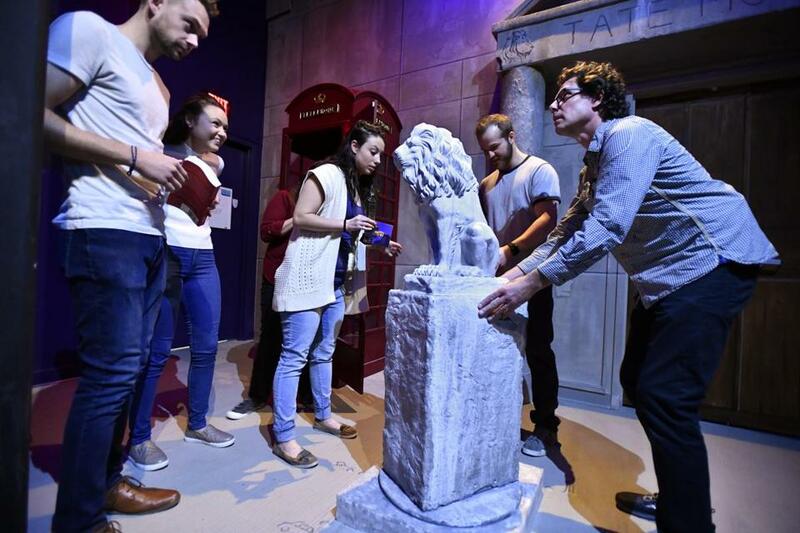 From left: Richard Jenness, Anne Healy, Chrissy Barrows, Robert Sack and the writer work together in an escape room adventure, set in London, at Skeleton Key in Lynnfield. No problem. I’ve assembled a crack team. There’s Jenness and Woods, our communications experts. Healy and Barrows are hackers. Sack is our code breaker. “We need to find the combo to this padlock,” Healy offers. “Let’s find the code,” says Sack. “There are markings here.” That’s Barrows. And then there’s me. What’s my role? Despite my sad advice, we’re making progress. We locate a hidden a key, break into a black taxicab, and solve one of the padlock codes. But what number to dial once we’re inside the classic red British telephone box? Could the flickering lamp post or the London Underground map offer anything? Or are they red herrings? Later, when we get to the actually gallery, I’m sure paintings by Liechtenstein and Klimt and a bust of David Bowie will reveal more secrets. All the while, a digital screen shows how much time remains. We initially had an hour to solve the entire shebang. Now we’ve only got 23 minutes. To my mind, not knowing is part of the fun. For others, that might lead to frustration. Escape rooms are hot. According to one directory, some 50 of them exist in Massachusetts alone, so you’d think the market would already be super-saturated. But Skeleton Key offers a new twist on the fad. From left: Barrows, Jenness, Healy, Charlotte Woods and the writer try to find the next clue. While most escape rooms are located in lower rent locations like factory lofts and industrial spaces, Skeleton Key is smack dab in MarketStreet Lynnfield, a luxury open-air shopping center on the North Shore that’s home to upscale shops and dining spots such as Whole Foods Market, FuGaKyu, Legal C Bar, lululemon, and Pottery Barn. Targeting a more high-brow clientele, Skeleton Key offers what Weaver calls a “premium environment.” The Harvard Business School professor turned entrepreneur behind the Muse Paintbar chain is hatching plans to open Skeleton Key in West Hartford, Conn., and White Plains, N.Y, later this year. All three locations, he says, cost “in the millions” to bring to life. I’ve done several escape rooms. I can vouch that Skeleton Key’s production design is a cut above the rest. No handmade props or sets made by some theater school dropout here. The posh, speakeasy-themed bar/restaurant and waiting area is bedecked with a couch and stuffed chairs, cafe tables, a wall of curios, even a throwback pneumatic tube system that allows customers to send messages to the spirit world (or some backstage presence). Another plus: Before or after the game, patrons can enjoy beer and wine, circus-themed snacks like carnival popcorn and corn dogs, or a sit-down meal of chicken and waffles sliders and shrimp tacos, among other options. 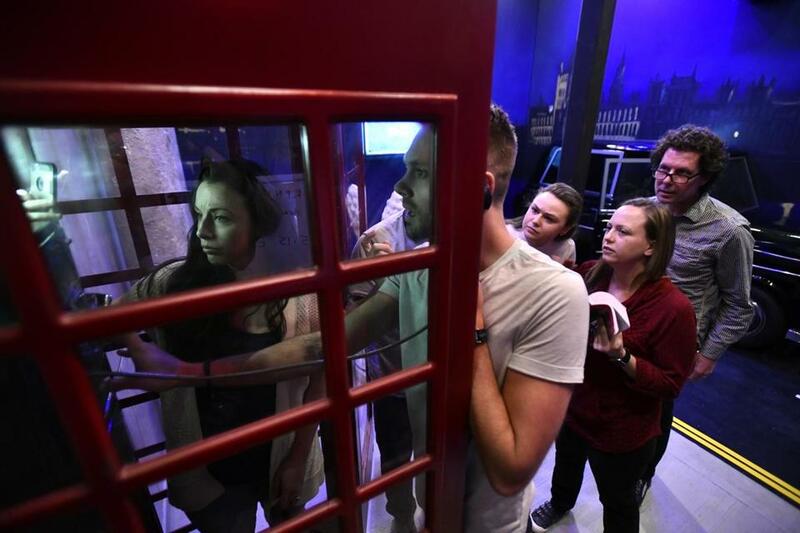 These escape rooms are enhanced by cool soundscapes and lighting, but the special effects don’t overwhelm the immersive real-world experience. “The technology is there to enable an analog experience,” says Matthew Haber of BeSide Digital. Robert Sack (left), the writer, and Charlotte Woods work together at Skeleton Key. 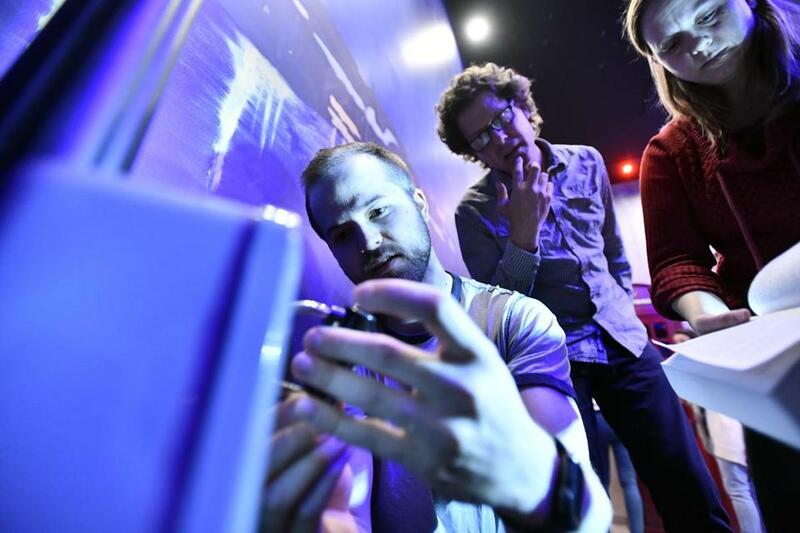 I think this is the appeal of escape rooms: In an increasingly online world, we long for in-person, interactive experiences. I know I’m stuck for too many hours in front of digital screens. I agree. Doing something as a team to achieve a goal makes the win all the more sweet. If six strangers can work together, perhaps there is hope for the human race. Whoever you’re with, you’ll likely find the excitement of an escape room palpable. You can’t help but become invested in solving the puzzles in time. As for our team, we do. We figure out the final clue that allows us to snag the Van Gogh . . . with a whopping two minutes to spare. We exit into the entryway to debrief. “I like the mind meld,” says Charlotte Woods. 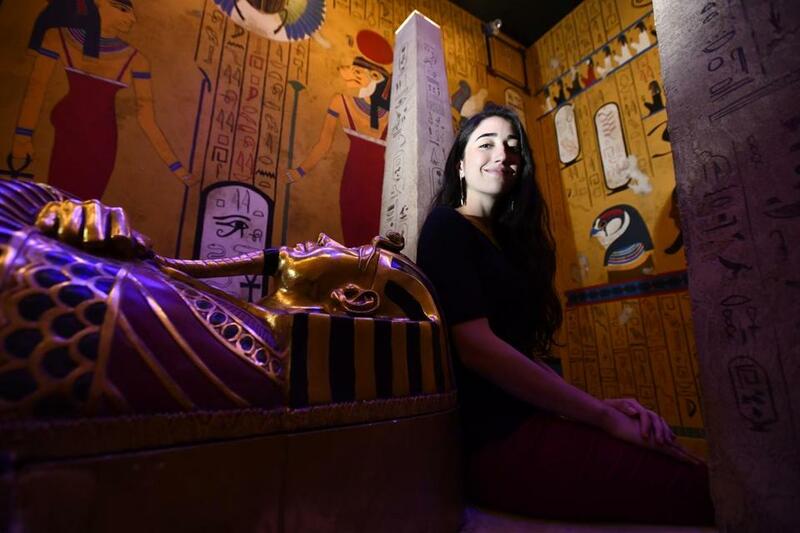 Michelle Frea, director of game development, in the Egyptian tomb-themed room, found inspiration for the hands-on riddles in children’s museums. Skeleton Key, 663 Market Street, Lynnfield, skeleton-key.com $24-$32.